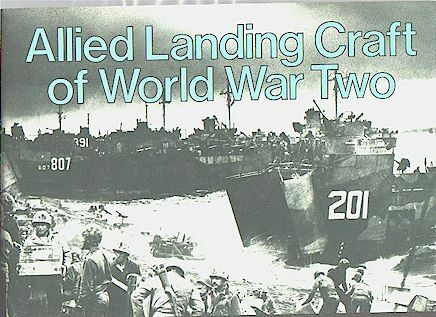 "Allied Landing Craft of WWII"
Printed in 1985 originally printed in 1944. This book is a faithful reprint of the original US Navy Intelligence manual with its supplement printed in hardback in a small landscape format on good quality paper. In its 200 + pages it covers all known types of landing craft. Each is given its own section and the history of that type is fully explained along with good quality photographs and plans in side elevation and plan form but not to constant scale. However each plan does have the measurements alongside it, so there should be no problem for scratch builders. Split into sections it has the following, 20 pages of data on all types of landing craft, Dinghies, Boats, Ships, Tracked and Wheeled. The next 100 pages show all various types from the very smallest to the LSI (H) ships in photographic form and plans. The second half is the supplement Titled No 1, this has a further 25 pages of hard data and the rest is given over to the various types again it follows the format of the first part. If you are into Landing craft of any type then this as far as I know is the only book, which covers them all. I recommend this book very highly and if you see one second-hand, buy it, as it is now a very rare book. The only reason why I am reviewing a book that is out of print is quite simply to help all those model makers who keep asking about Landing craft on the net. If they know about it then they can search out a copy for themselves. The best of luck in your quest for further knowledge.